After Alejandro de Tomaso took over control of Maserati, he almost instantly started working on a new Quattroporte. Italdesign had presented two show cars in 1974 and 1976 called the Medici I and II, based on these two cars the new Quattroporte was penned down by Giorgetto Giugiaro. At the 1977 Turin Motor Show the new Quattroporte was first shown to the public and delivery started in 1979 with two models: the 4200 and 4900. The 4200 which actually had a 4.1 litre engine was phased out later in the car’s life cycle. The Quattroporte III (called 4porte in the first years) was an artistocratic and very luxurious car with lavish full leather seats (from SALT Turin), meters of wood and lots of other extras such as airconditioning. The chassis was based on the other Quattro-Porte baring the name of Maserati’s new owner: the de Tomaso Deauville. 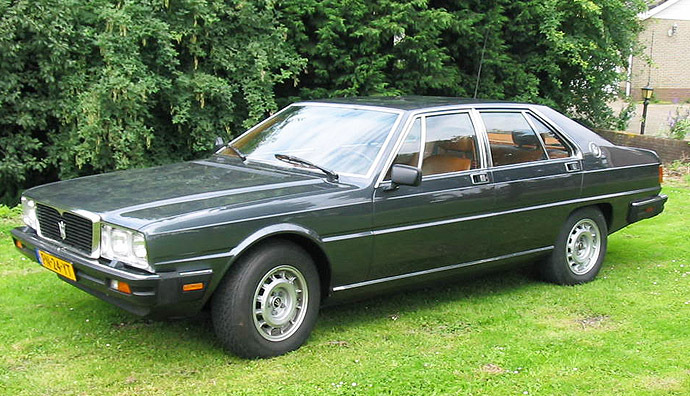 In 1986 the last Quattroporte III’s were slightly redesigned, upgraded and called Royale. Production seized in 1990 with more than 2,000 units produced.